Show two ways of preparing the alkene below via the Wittig reaction starting from triphenyl phosphine (PPh3). Is one route better than the other? Why? Alkenes can be prepared from a combination of ylide and aldehyde or ketone. This is the Wittig reaction. One carbon on the alkene comes from the carbon bonded to the PPh3 on the ylide, and the other carbon comes from the carbonyl. 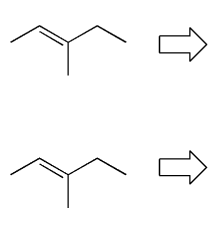 There are usually two different ways to make an alkene via the Wittig reaction. So is one way better than the other? Yes. Ylides come from the SN2 reaction of PPh3 with an alkyl halide. Because it's an SN2 reaction, you want to use the least substituted alkyl halide! (1º is better than 2º). So of the two reactions below that would result in the desired alkene, the top method is better because it involves the less bulky alkyl halide. This principle also holds true for the Williamson ether synthesis (problem 703). Less substituted alkyl halides are better for SN2 reactions. MendelSet practice problem # 711 submitted by Matt on July 22, 2011.